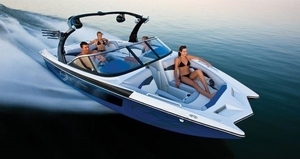 A ski deck boat is a small powerboat (5-9 meters), generally without a cabin. It has seats and sundecks for outdoor enjoyment. Powerful engines and a cockpit unencumbered toward the stern facilitate water skiing, wakeboarding and other towing sports. In addition to water skiing, these craft are suitable for fishing, family outings and relaxing off the beach. Their only limitation is lack of cruising ability, as they have no cabin, galley or berths. It should be noted that they are not designed for bad weather, cold or rain. The deck is generally molded to provide numerous benches and sundecks. Many have a forward cockpit. However, most have modular deck plans which can take on various configurations. An inboard hydrojet engine is best for towing sports since it eliminates the dangers of a propeller when recovering or putting a skier into the water. Most of these boats have a central or lateral helm with seat and windshield. The hull and motor are designed to start and reach planing speed rapidly. Though rare, some models have a cabin with a few amenities. Size will determine the number of passengers the craft can carry.